Your car's OBD-II Port should be located in one of the three areas highlighted below. 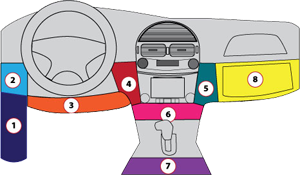 The most common location is in section 3 below, which is just left of the steering wheel and underneath your dashboard. Some vehicle's OBDII Port might be located behind a latch or contain a protective cover. You should not have to do anything more than open it up to reveal the OBDII port. Hudly is usable even without the OBDII port via the Cigarette Lighter (CL) power cable. You'll have your phone mirroring capabilities, but no access to Onboard Vehicle Diagnostics. Remember: The OBDII port is designed to be easily accessible by every auto manufacturer.